The Firefighters barracks matches the CB1 Type program and is located in Quinta de Geão, at the lot 28, of 4770 m2. The building comprises a total gross area of 1173 m2 and lodges the support functions to the fire brigade. Starting from the “Lobby – Access”, it is organized in 3 floors. Collateral event hosted by the Fondazione Querini Stampalia in Venezia. 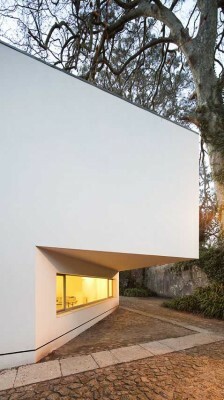 The exhibition was exclusively dedicated to the most personal aspects of the Portuguese architect Álvaro Siza – one the leading players in the international design scene – who was recently awarded the Golden Lion for Lifetime Achievement at the 13th International Architecture Exhibition – la Biennale di Venezia. He describes himself as a functionalistic architect. Latest building by architect Álvaro Siza Vieira: in stark contrast to the main building’s Belle Epoque opulence, The Spa is a minimalist oasis of clean lines and white marble. This is one of a set of buildings of the School of Architecture of Porto (FAUP), in Portugal, designed by architect Álvaro Siza. Built between 1985 and 1986 has recently been rehabilitated.